Image from SWG not the Emu. Last night I received a gift. 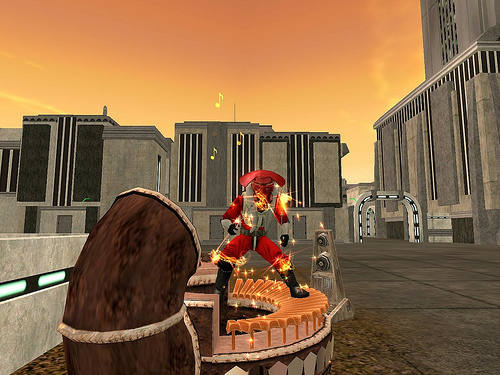 I was able to play SWG the proper way for the first time since April 2005. That was the date the dreaded combat upgrade went into place. That was the month I stopped being an entertainer (for a while). I left my guild which was originally started to be an entertainer guild. I eventually moved out of the town that I was the first mayor in. April 2005 truly was the beginning of the end. I will say that I continued to play Star Wars Galaxies off and on over the last six and a half years. On December 15, 2011 the servers went dark for one last time. It was the spark that disappeared from one of the most advanced MMOs that was ever created. Everyone knew about the emulated servers. The last most of us looked they were not in a game worthy state. It just a small place to visit and have small duels. It was not a world we could truly occupy. With the alpha release of the emu, that almost has changed. I use the term almost because there are still things to work out. There are a handful of professions that still need to be implemented properly. The bazaar terminals are down for another week. The control lag makes things a bit awkward (but I’m assuming this is because of the popularity). It does however feel like home for the first time. I think the strangest thing about last night was playing the game in OSX. There never was an OSX client for the official game. The clever hackers at the emu managed to use a Wine wrapper and get the game working perfectly. At first I could only play in windowed mode, but I managed to fix that myself also. Once in the game so many things came flooding back and some were still out of reach. Our friend Imcus is getting the band back together. He is working through word of mouth of collecting the Star Wars Galaxies Intrepid people. Together we may at least have a home again that we can inhabit or at least visit. He warned us to skip the new player tutorial or we wouldn’t get our modest stipend. I recreated Creeva and chose the entertainer profession. This means I got the ugly white outfits with the yellow strips. I also received 1100 credits, a CDEF pistol, a survival knife, and a maroj melon. Then the game told me to go. For those who had never played the game, I will say they would be completely lost. Go? Go where? What do I do? The answer of course is – whatever you want. Welcome to the sandbox world of gaming. Do you want combat? You can become a fighting profession. Do you want to make things? You can become a crafter. Do you want to entertain? Then get in the cantina and shake your booty. We don’t have quest A, then B, then C. We dont’ need them. We have a virtual world with a war going on. We can do whatever we want. What did I do? Well I knew what I needed. I was already and entertainer, but I also knew what I wanted to be when I grew up. I went to the scout trainer so I could get terrain negotiation. I then went to the marksman trainer so I could start my journey towards rifleman. Then Xie and I headed from Theed to Keren, she needed to track down the brawler trainer. Xie will be the Tera Kasi Artist again, the way she is supposed to be. We showed up at the shuttleport and bought our tickets to the Keren Starport. We dutifully took our tickets to the protocol droid. He told us there would be a three-minute and forty-one seconds until the shuttle would arrive. How rude! Don’t they know who I am. When I left the galaxy shuttles would be at my beck and call . We waited and the shuttle arrived. We were on our way to the next town. While in Keren we decided to go do a mission. We had to remember that we needed to get all the missions (2 per person) in the same direction. We headed out towards the first mission that was 1100 meters away. When we made it within a hundred meters it respawned another 400 meters away. Oh the joy and pain for SWG missions. We snuck up cautiously over the ridge and saw the beast we had to kill. It was the dreaded Peko Peko birds that haunt the countryside of Naboo. They give children nightmares and share the bones with the gungans. They are nasty creatures. I drew my little CDEF pistol and wished I had a rifle with me. I took aim and shot at the first one. I hit the Peko Peko and he did not like that. He came right towards me. Xie proceeded to slap him around and call his mother a durni. I just kept shooting. I was running up and down the hill doing my best to not fall to this dangerous beast. Finally he must have been exhausted from chasing me, he laid down and died. Then we took out its dreaded lair. Before the fight was finished we took at least a dozen of those dreaded menaces to be one with the force. We collected our 684 credits and decided to head back to the Starport. We decided we would head for the largest hive of scum and villainy in the galaxy, Mos Eisley. When we entered the Keren Starport I went straight for the ticket terminal. Xie went to the starship terminal wondering why it wasn’t working. I gently reminded her that it was part of her previous life, not her new one. We both ran to the starship at top speed so we didn’t miss our flight. We arrived in Mos Eisley safe and sound. However, I believe our captain took us through a meteor shower on purpose. Regardless, we could smell the crisp desert air even in the Starport. There were people out front milling about, but we pushed past them and headed to the cantina. When we entered the cantina it was exciting. There was at least fifty people inside. I setup in the middle of the floor and played that number one hit “Star Wars 1”. Who can forget the shrill sounds of a slitherhorn gently putting you to sleep. The blatting overtones were music to everyone’s ears. Xie danced elegantly and beautifully as always. After a while I noticed that I was ready to learn some new things. Unfortunately there was no one responding to my requests to be taught. So I kept playing until I had to go to bed. I didn’t want to go to bed, but unfortunately we are not as young as we used to be. Before saying goodbye I went to go find a NPC (Nice Person. Cool!). I was hoping I might find a nice CDEF rifle on him, after I lulled him to sleep. I couldn’t find one anywhere. I did find a nice narglatch with a red sign on him. I thought that meant he was ready to party. I went up to pet him and the next thing I know I awoke in a cloning center. I then logged. In the past when I switched servers they didn’t have the feel of Intrepid. I wasn’t there in the beginning. I’m now on a server that is just forming. It is going to find its identity and I’m going to put my little fingerprints in at least part of it. I might even find a home there. Tajiri here. Just thought I’d drop in and share some info about the “Return of the force (ROTF)” swg emu server. This is a permanent server with NO WIPES. A friendly community though small is growing all the time. The admins/developers are very active and work towards improving the game play. Jedi is unlockable. Everything is earned. At the moment there are character builder frogs in certain areas that only gives minor buffs. This is only until more doctors are around. XP is times 4 for combat. Thats until the server gets bigger which im sure they’ll turn it to normal. Myself and a few of my own have been playing there for about a month now including someone who some of you might know, Banzia and yes he’s still pvping in hotpants. Jedi fear him which is pretty funny.